Matt Symonds (pictured second from right), an International Hospitality Management alumnus, is Regional Managing Director for CH&Co, which provides the catering at more than 700 locations across the UK and holds a Royal Warrant for catering services to HM Queen. Matt, who graduated in 2001 and whose career has included managing the catering for venues including Goodwood and Wembley, visited BU to find out more about FoodSMART. This EU-funded project is an industry-academic partnership led by Bournemouth University. The project has developed an app to help caterers share allergen information and customers to make informed food choices. It is targeted at workplace catering, where staff regularly eat prepared meals with little knowledge of their ingredients or nutritional value. The project responds to links made between the rise in ‘eating out’ and rates of obesity. Matt said: “I am a big fan of technology and exploring how it can be used to improve the way we work. The contract catering industry is extremely competitive, so I am always looking for something that can add value to our clients and differentiate us. I am keen to hear more about FoodSMART and explore how it could be integrated within our business such as ours. Posted March 28, 2018 . Filed under News. Posted March 18, 2018 . Filed under News, Student Experience. This scholarship is available to any UK or EU applicant for a full-time taught Master’s degree in a Tourism and Hospitality subject from the Faculty of Management, excluding Postgraduate Diplomas, who can demonstrate an outstanding academic profile relating to their course. You will need to have a minimum of an upper second-class honours degree (2i) and must fill in an application further highlighting your academic achievements and explaining why you should be considered for this scholarship. If you’re successful, you’ll be notified within one month of the closing date for applications. Entry For courses starting in September 2018 and January 2019. Scholarships cannot be deferred. You must have achieved a minimum of a UK upper second-class Honours (2i) degree (or overseas equivalent) that is relevant to your postgraduate study. You cannot be in receipt of any other BU scholarships. Application deadlines 31 May 2018 if your course starts in September 2018 and 18 November 2018 if you course starts in January 2019. Applications for January 2018 have now closed. This scholarship offers a 50% reduction in tuition fees for students applying for a full-time Master’s degree within the Faculty of Management. Our International Admissions Team can help if you need any clarification about whether your qualification is applicable. The BU Vice-Chancellor’s Scholarship for the most-promising postgraduate (Master’s) applicant will be awarded to a UK or EU student who has already completed an undergraduate degree with us. As well as assessing your academic achievements, the awarding committee will also consider the personal statement you submit with your application. This needs to demonstrate that you are an outstanding applicant for a BU postgraduate course. If you are successful, you will be notified within one month of the closing date for applications. Your scholarship can’t be formally approved until you hold an unconditional firm (UF) offer with BU. If you would prefer to complete a paper application form, please contact us. Dr Tim Gale will talk at the Visit Isle of Wight’s annual tourism conference about the closing the performance gap between coastal tourism and the visitor economy nationally. Posted March 11, 2018 . Filed under News. Visit Isle of Wight’s annual tourism conference is set to welcome a host of speakers from the industry next Tuesday (13th March). Dr Tim Gale will talk about the closing the performance gap between coastal tourism and the visitor economy nationally. Bembridge Coast Hotel will host the event and attendees will have them opportunity to hear from speakers on a range of topics from accessibility for less abled visitors, to dark sky tourism. The conference is the sixth of it’s kind and is just part of the work that Visit Isle of Wight carries out to increase the level of tourism on the Island, bringing a global picture of the industry directly to businesses that are part of the Wight BID levy. Patricia Yates, Strategic and Communications Director of Visit Britain, will lead the conference with a speech on tourism growth and how the Isle of Wight could increase the visitor economy here. Conference sponsors Quality In Tourism will discuss their new assessment scheme and the NFU Mutual will lead a presentation on attracting and retaining staff in the tourism industry. 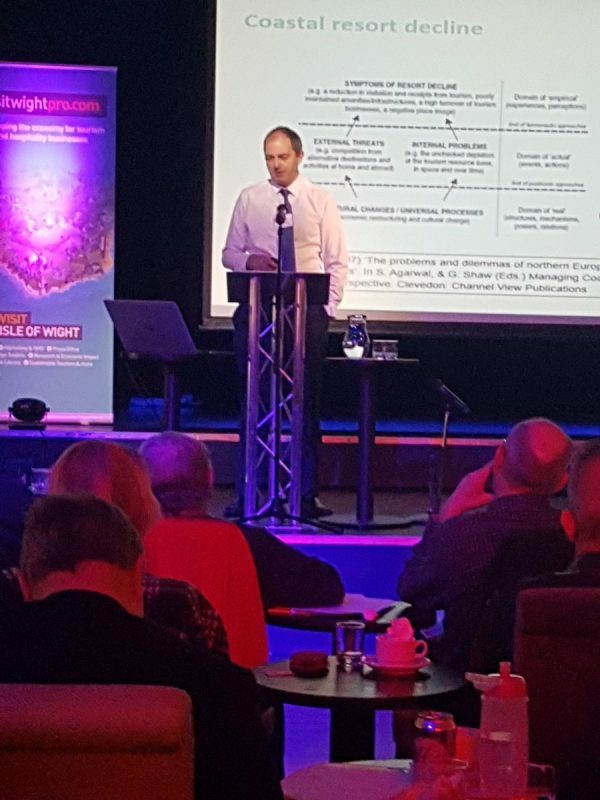 The conference rounds off with the talk from Dr Tim Gale, a senior lecturer at Bournemouth University, who will deliver his views on the closing the performance gap between coastal tourism and the visitor economy nationally. Visit Isle of Wight’s new MD, Will Myles, will make the closing remarks. There will be plenty of opportunity for guests to network and Visit Isle of Wight has invited a selection of businesses to bring exhibitions demonstrating the latest updates in their line of work. Harry Champion from Bournemouth University and Mia Jorjikia from Oxford Brookes University have been named as the Young Guns of 2018. 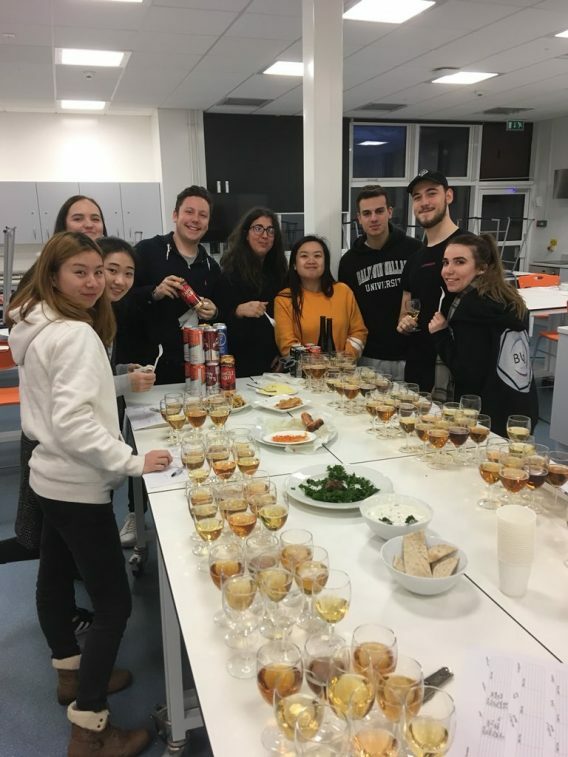 The two students, who are both studying International Hospitality Management, were awarded the accolade by the Council for Hospitality Management Education (CHME). Young Guns is a competition open to students completing hospitality degrees, or degrees with hospitality focused modules, which include work experience as part of the programme. It gives students a chance to demonstrate their passion and drive, as well as the opportunity to get noticed by top employers. 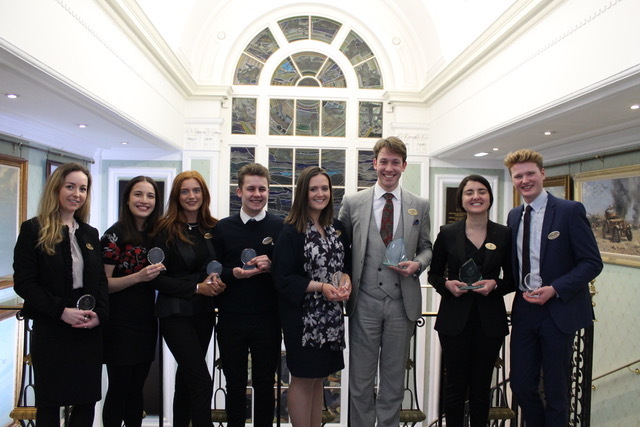 The final took place yesterday at a networking lunch held at the RAF Club in London’s Mayfair, eight contenders competed in what was a closely fought final. Champion and Jorjikia impressed the judges with details of the successes they achieved during work experience and their plans for a future hospitality career. 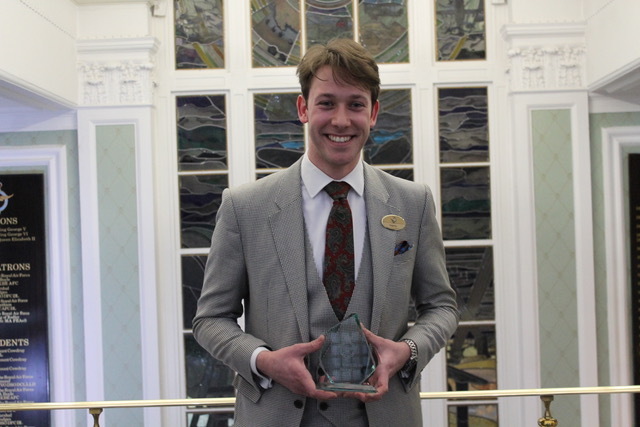 Champion worked in the events team at Anton Mosimann’s private members’ club in London, Mossimann’s for his work placement and hopes to take up a position at Guards Polo Club in Windsor following the completion of his degree in the summer. Champion said that it was “a real honour and privilege” to receive the Young Gunns award. “I very much enjoyed taking part in the final and met some wonderful people, I’m now looking forward to being an ambassador for hospitality in the future,” he said. 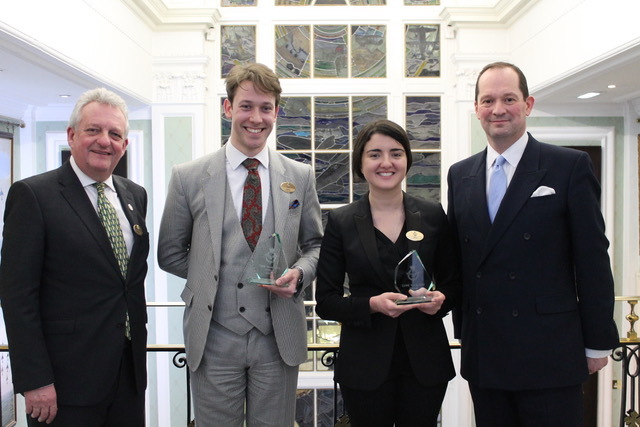 As well as receiving the glass Young Guns trophies from RAF Club chief executive and club secretary Miles Pooley, the two winners will also receive a year’s membership for the Institute of Hospitality, a year’s subscription to The Caterer and an invitation to the Cateys. Joining Pooley on the judging panel were Ben Buet, senior operations manager of Purple Cubed, Liz Cave, director at Your Invisible Partner; Peter Ducker, chief executive of the Institute of Hospitality; Jackie Gilbert, vice president operation UK – Mercure and Ibis Styles hotels at AccorHotels; Paul Hurren, managing direcror of Lusso Catering; Tim West, former managing director of Lexington Catering; and Janet Harmer, associate editor at The Caterer. Posted March 9, 2018 . Filed under News. BU Department of Tourism & Hospitality will be hosting the CHME 2018 Annual Research Conference in May. The Conference theme is “Innovation in hospitality: Connecting all stakeholders to deliver memorable experiences“. To foster high quality research from undergraduate and master students, CHME 2018 is organizing a special session and inviting students from all over the world to showcase their research outputs. Meanwhile, we are offering three Best Research Paper Awards for students joining this session. We would like to invite our students in all levels to submit your piece of research work. It can be your final year dissertation, course work, or other relevant work. As a student in Faculty of Management, you can benefit: 1) the registration fee will be waved for our own students (originally it is 190GBP); 2) Free meals and drinks (those included in the registration only); 3) publication opportunities (three awards for publication in different journals); 4) and a lot of social opportunities with the industry leaders and academic professionals. The following is the requirement of the submission. Any inquiries about the paper submission or review process should be sent to Dr. Daisy Fan. 1. There are two files to be submitted. Cover Page includes authors’ names and affiliations. The Extended Abstract should be up to 1,500 words, including research objectives, literature review, methodology, key findings (if available), and conclusion (typed, double-spaced, 12-point, Times New Roman font). 2. A Best Paper Review Committee will conduct a refereed review of the submissions. Award winning students will be invited to submit their full papers to a peer-reviewed journal. Posted March 9, 2018 . Filed under Alumni News, Events and Conferences, Research. Posted March 6, 2018 . Filed under Student Experience. Posted March 5, 2018 . Filed under Alumni News, Events and Conferences, Student Experience. Delivered by industry professionals, our STEEP workshops are designed specifically for you – our Faculty of Management students. The graduate job market is hugely competitive and your CV needs to stand out from the crowd and properly showcase your skills. In liaison with your Programme Leaders and industry experts, we’ve identified the key skills that are invaluable to you when applying for your first graduate roles or for your placement. Places on these STEEP workshops are limited so book fast and kickstart your career today. Kickstart days aim to provide you with snippets of key information to help you kickstart your journey into your first graduate role. Key speakers from inside and outside BU will provide you with the tools and knowhow to aid you in this journey. These workshops have been designed specifically for Level 7 students looking to gain additional professional skills and qualifications to improve employability. The workshops listed below are exclusively designed for final year Faculty of Management students to help you secure your first graduate level job. If you are a second year, level 5 students, please see below for workshops designed for you. Microsoft Office Specialist (MOS) is a recognised qualification that allows you to validate and document your working knowledge of essential Microsoft programmes on your CV. It will allow you to present yourself as truly knowledgeable and differentiate yourself in the competitive graduate job market. For more information and to book, visit MyCareerHub. The workshops listed below are exclusively designed for second year Faculty of Management students to help prepare you for finding a placement job. If you are a final year, level 6 student, please see above for workshops designed for you. Dr Sean Beer on BBC radio discussing the impact of the snow and storm Emma on food supplies in supermarkets. Posted March 5, 2018 . Filed under News. This morning Dr Sean Beer was much in demand on BBC radio discussing the impact of the snow and storm Emma on food supplies in supermarkets. Sean maintained that pictures from across the UK of empty supermarket shelves were just another example of the vulnerability of our food supply chains. This was hot on the heels of ‘nugget’ shortages and problems with meat supply to other high street eateries. Sean described a food supply chain that was long, complicated and therefore at risk of disruption, with half of a supermarkets food on the shelves and half in lorries on the way to the shops. Having said this by the end of the week consumers will have forgotten the shortages, just as they have forgotten foot and mouth and the horsemeat scandal. What is needed is a wholesale review of the food systems that underpin our lives; from economic, social and environmental perspectives, but people have short memories and do they really care? After all, as Sean Says, if he came up to you and asked to put his fingers in your mouth you would call a policeman; yet every day we put food into our mouths without a second thought as to where it has come from!